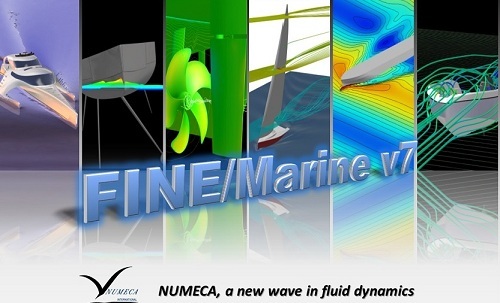 The FINE / MarineTM program is the first high-level calculation software complex in the world dedicated to solving specialized tasks of ship hydrodynamics. To create grids in the complex included an automatic generator of unstructured hexahedral grids with an explicit resolution of the viscous boundary layer HEXPRESSTM. FINE / MarineTM implements the RANSE approach based on the ISIS CFD solver developed by ECN and CNRS (Laboratory of Hydromechanics, Department of Numerical Hydrodynamics), France. solve the problem of modeling the motion of one or several absolutely rigid or deformable bodies on the free surface of a fluid (motion of marine objects).